Nipper was a stray fox terrier mix that gained a spot in electronics history as the symbol of RCA. Nipper was chosen as a model for Francis Barraud's painting entitled "His Master's Voice" (which was originally titled, "Dog Looking at and Listening to a Phonograph"). In fact, Nipper would sit at the horn of Barraud's Edison cylinder phonograph with his head cocked, just like in the painting. 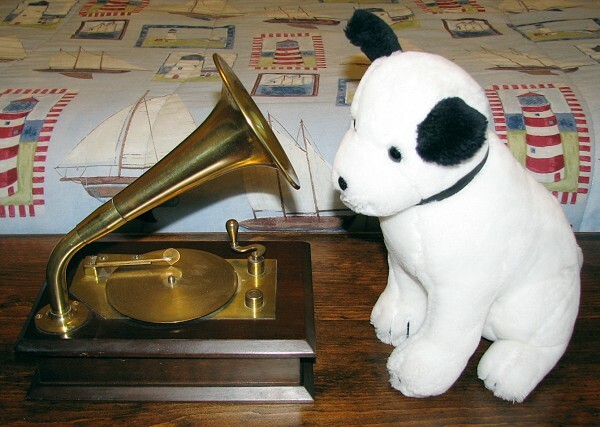 Nipper appeared on every RCA Victor record label from 1929 until 1969. A few years ago, Melanie bought a Victrola music box, which I figured needed its own Nipper to be complete. Here is what we came up with. While it has nothing to do with electronics, I ran across a surprising (to me) article regarding oil consumption in new cars. Industry-wide specs claim that 1 quart per 600 to 1,000 miles is the norm. That accounts for blow-by past piston rings, seepage past valve guides, or other means. Catalytic converters prevent the old tell-tale bellowing of blue smoke due to oil burning, so in newer cars it is not as apparent. The topic came up when the owner of a 2007 Toyota Solara complained that his engine was going through a quart every 2,000 miles. My 2007 Chevy Cobalt (2.2L, 34 mpg) loses almost no oil between 3,000-mile changes. Here is a similar statement on oil consumption. Evidently, higher education is a bad thing if your are male. Last year we learned that terrorists are likely to be male electrical engineers - compliments of Oxford U. Now, another esteemed academic study group has determined that men who attend college are more likely to commit property crimes during their college years than their non-college-attending peers. This brilliant piece of research is slated to be presented at the annual meeting of the American Sociological Association. Perhaps the most significant finding of note is that highly educated social behavior researchers possess a greater than normal propensity to produce studies which find that educated men have a greater than normal propensity for crime. U.S. coinage is manufactured to very precise standards, and, even allowing for wear, make very good weight/mass standards when you need to calibrate scales to within about ±1.5%. Here are the official weights. Per scientific methods, three decimal places of precision for U.S. coins implies an accuracy of at least ±5e-4 g (±5e-3 g for Euro coins), but that does not jive with Mint's claim. * A penny is 0.750" (¾") Ø. Students from 368 colleges of all types were polled for opinions of various aspects of the school. Here are some of the result for engineering colleges. Check yours. #2 Franklin Olin Coll. of Eng. #1 Mass. Inst. of Tech. #2 Franklin Olin Coll of Eng. #3 Calif. Inst. of Tech. #14 U.S. Coast Guard Acad. #1 Stevens Inst. of Tech. #2 U.S. Merchant Marine Acad. RF Cafe Breaks the PageRank 5 Barrier! A major component is the ratio of inbound links vs. outbound links. For a site like RF Cafe, where I link to many other sources, it is a real battle to get the ratio to even reach parity. After many years of lingering at PR5, RF Cafe finally has achieved PR6 status! Thanks to all who have linked in and who visit regularly.